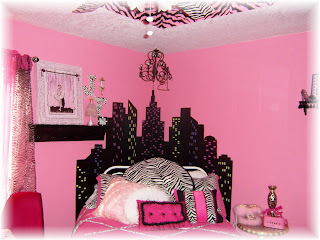 What is hot pink, has zebra stripes, a New York skyline and fashion elements galore? Jenna's Boutique, that's what!!! 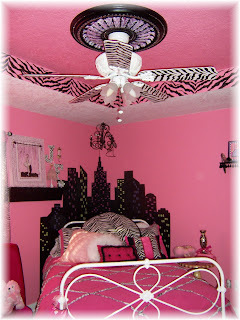 Jenna is a cutie and she wanted her room done in hot pink zebra. She has a passion for fashion and her mom, Jeaneatte, even has her own jewelry, purses and general girly stuff business called Jewels by Jeanette. 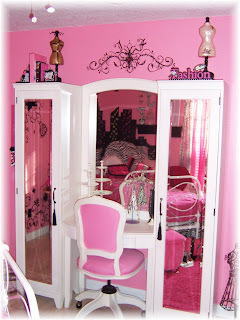 When Jeaneatte asked me to design this room, I was all over it. 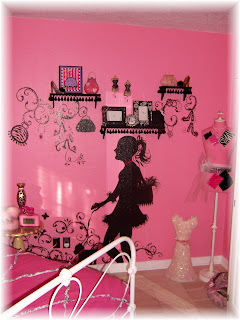 I LOVE to do little girls' rooms and she gave me free reign on this one! I always love to hear that! My sister Judy is an interior decorator, so when we team up, there's no stopping us really! So we started out by having the walls painted pink and picking out the bedding and we just decided to add in a shopping trip to New York! I started out by sketching in the skyline and then my niece Audrey helped me paint it in solid black. I then just took a brush and added windows with purple, neon green and pinks...added a little glitter so they would shine with the lights!! Now this area was fun. 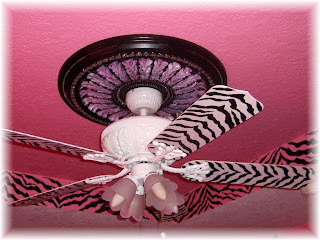 I painted zebra on the ceiling and on the fan blades. 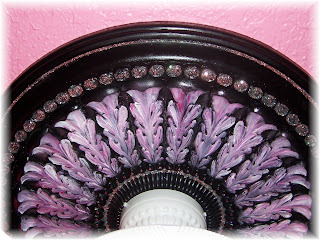 Check out this ceiling medallion. 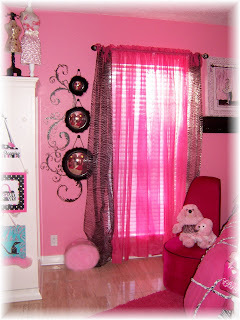 It was white to start with, painted it black and added pink accents and a double-dose of bling! This is such a cute piece of furniture from Potter Barn Kids. When it opens, it has message boards, drawers, etc., really cute. 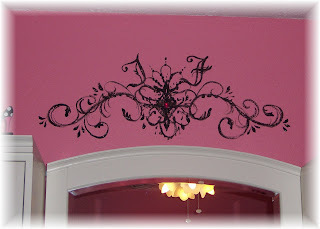 I added JF with scrolls above it so Jenna could have her own brand like Juicy Couture! This is my favorite part. I had Jenna stand near the wall and did the old lamp trick to outline her shadow. So that is actually Jenna headed to that New York skyline with her dog Princess to shop baby! I also painted little purses, shoes and jewelry hanging down from these scrolls. We even glued bling to the wall around Jenna's neck, the dog for the collar and various other places. What shopping experience would be complete without a fitting room? 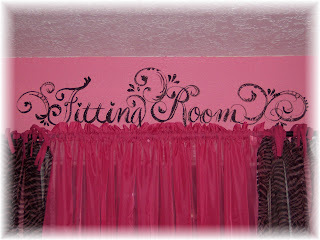 This is Jenna's closet and I just painted scrolls and the words "Fitting Room" above it. 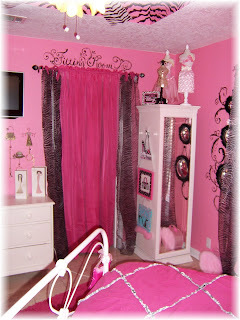 I created a lot of the accessories for the room too. 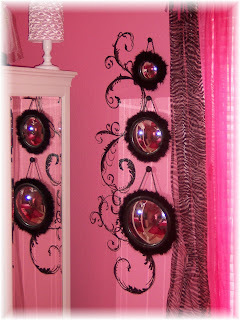 These mirrors were just plain black and I added the fur trim around the edges and painted the scrolls. Another cool piece of furniture here, this unit spins around and all the storage is hidden! Judy and I hung everything on the walls and placed all the chotskis! Mucho fun! 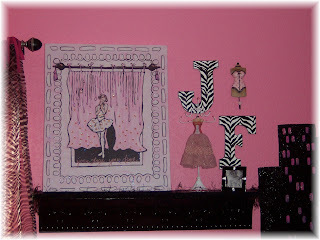 Judy helped add the fabric pieces to our lady here and I painted the chalkboard to the right hanging on the wall. Jenna's name is on it in pink glitter at the bottom, kind of hard to see in this pic though. This is one of the pieces that was on the episode of Paint, Paper & Crafts I filmed last year that aired recently on PBS. More foo-foos, I painted Jenna's letters here. All in all, everyone is very happy with the way it turned out. 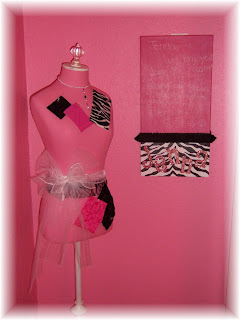 I have a sign to make for the door that says Jenna's Boutique and a few other little things to do, but I thought I would just have to share this for all those girly girls out there! 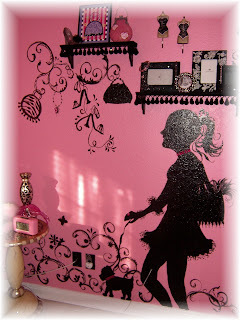 Hopefully you can get some ideas for fun ways to spruce up your girls' rooms! Hugs and God Bless You and Your Brushes!